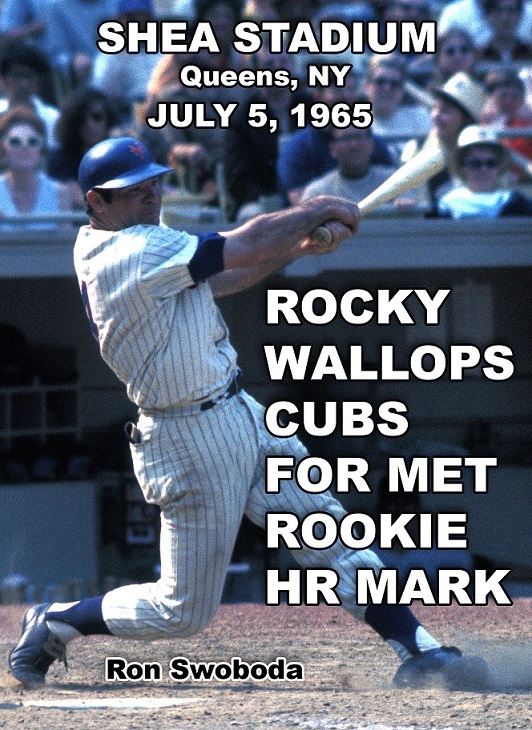 ON THIS DAY: July 5, 1965. Rookie sensation Ron Swoboda clouted two home runs and drove in five of the six runs the Mets scored in a 3-2, 3-0 doubleheader sweep of the Cubs at Shea Stadium. Swoboda affectionately know as Rocky to the Shea faithful slugged a three run home run in the first game and two run blast in the second game. With his 14th and 15th home runs of the season, Rocky set a new club record for most homers by a rookie, besting the previous mark set by Jim Hickman in 1962. He’d finish the year with 19, which remained the mark for freshman excellence until Darryl Strawberry pushed the present record to 26 in 1983.